If Barclays Center can host four title fights in a night, then why can't a nearby neighborhood get a boxing gym? From my house in Bed-Stuy, it’s just three stops on the G train and a quick walk to the Barclays Center, where on Saturday night Golden Boy Promotions and Showtime brought boxing’s championship tradition back to Brooklyn after 81 years. I recently found myself trying to figure out which block in my neighborhood Floyd Patterson and his family had moved to from North Carolina in 1936. I was trying to imagine him as a boy, scooping up a full crate of bottles from a soda factory and scooting away from the cop who spotted him. Story goes, an officer nabbed the young Patterson and dragged him back to the soda plant. As W.K. Stratton writes in his biography, the young Patterson started to cry, so the cop picked up a crate and smashed it over his head. The violent act called up so much rage in the boy — a child tender enough to remove his father’s shoes and wash his father’s feet when he returned home from 20 hours of work — that it took several police officers to subdue the future champion. Patterson was sent upstate to Wiltwyck School for Boys, where he transformed himself — from a truant, petty thief and outsider into a young man with the capacity to dream. That is, he could imagine his future. And his future was boxing. You probably know the story: Patterson hooked up with Cus D’Amato at Gramercy Gym, won Olympic Gold at Helsinki, and went on to become the youngest world heavyweight champion at 21, as well as the first fighter to lose the world heavyweight title and then regain it. Brooklyn figured prominently in his early career. Twelve of Patterson’s first 21 fights were at the Eastern Parkway Arena in Brownsville, a neighborhood important to Brooklyn’s boxing lore. That’s where Patterson’s last fight in the borough took place, on January 17, 1955. The venue closed its doors a few months later, reopening briefly for eight shows in 1958. Eventually it was torn down and turned into a parking lot. Of course, there was a much bigger and more famous building in Brooklyn called Ebbets Field. The erstwhile home of the Dodgers was also the site of Brooklyn’s last championship bout — before this past Saturday night. Maxie Rosenbloom beat Jimmy Slattery on points to retain his light heavyweight crown on August 5, 1931. The Dodgers fled west in 1957, and Ebbets Fields was demolished three years later. There were no big-time venues left for Brooklyn’s professional fighters in their own borough. Brooklyn boxers have done much to shape the sport in the past half-century, but they’ve done nearly all of that work away from home. Mike Tyson, Eddie Mustafa Muhammad, Shannon Briggs, Junior Jones — none of them had the opportunity to scrap on their home turf. So, for boxing, that’s the vision: for Barclays, the new arena downtown, to host the best local fighting talent. The results were mixed. At times, boxing’s triumphant return to Brooklyn was bogged down by dead rounds like those of the evening’s first championship bout between Devon Alexander and Randall Bailey. Alexander logged a sleepy unanimous decision over Bailey, who set a record for inactivity by landing just 45 punches over 12 rounds, something that had never happened in CompuBox’s 27-year history. Boos from the estimated crowd of 11,000 swelled right from the first round and continued intermittently until both fighters left the ring. Saturday’s best fight was between Peter “Kid Chocolate” Quillin and France’s Hassan N’Dam N’Jikam, who was fighting for the first time in the United States. Quillin popped N’Dam repeatedly with tight left hooks from several angles, including one that fires almost from the hip and looks like a shovel hook or even a bolo punch. N’Dam hit the mat six times, but he climbed back to his feet after each knockdown and resumed pressuring like hell to battle for his belt. 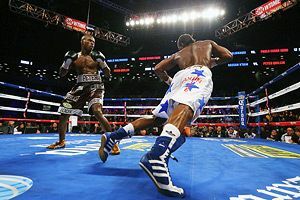 The French-Cameroonian moved well and had a great long jab when he used it, but Quillin’s knockdowns earned Kid Chocolate the WBO middleweight title. In the final fight, junior welterweight titlist Danny Garcia knocked out Erik Morales with a supercharged left hook in the fourth round that felled the future Hall of Famer like a sack of rags. Morales lowered his right hand to wind up for his own left hook, but Garcia loaded his wicked blast a split second sooner. As a result, Morales turned his head into the impact, which then swiveled his body first right, then left, and dropped him to the canvas and half through the ropes. After the fight, Morales announced that this would be his last bout in the United States. The end of Morales’s career in America wound up marking the rebirth of championship boxing in Brooklyn. I can walk from Barclays Center back to Bed-Stuy in a half-hour, especially when the sky over Lafayette Avenue is clear and crisp. So Saturday night I skipped the train and took the stroll. I kept thinking what a palace the new arena is — how the ushers greet you on your way in and wish you a good evening on your way out. Brooklyn’s own royalty was in attendance, with Mike Tyson and Zab Judah accepting loud ovations at ringside. I hear Riddick Bowe was there, too. The day before the fight, I found myself in Brownsville, the neighborhood that produced Tyson, Bowe, and Judah. It’s a tough part of town — been that way for at least a generation — but another local fighter, 34-year-old Martin Wright, offered to show me around. Wright’s record is nothing out of this world. He’s 11-1-2 with five knockouts against mostly no-name competition, and he’s the current U.S. New York State welterweight belt holder, whatever that means. Bed-Stuy Boxing, now called the New Bed-Stuy Boxing Center, was the project of a man named George Washington, who had been a sparring partner for Joe Louis. The gym has struggled to stay open, and Wright says its presence in the community has changed significantly. “You go by — you cannot tell if it’s open or closed,” he explained. “You go by there now, it’s more than likely open, but the gates are down. The gates are always down.” Wright says that the youth who would normally take advantage of the gym don’t even know that it’s available to them. I met Wright on the corner of Rockaway Avenue and Fulton Street. He was wearing a tan jacket and gray sweats, rocking a cap with a jagged “M” on it. In one hand, he had a bowl of oatmeal. We made our way up the avenue, and every 20 feet someone stopped to fist-bump him or say “What’s up.” He introduced me to a man named Alistaire, from St. Croix, who pulled off his welding mask to greet me. The ground in his small front patio was littered with metalwork. He had fabricated all the gates on Hull Street. Wright told me to ask Alistaire what he thought of a gym in the neighborhood, Alistaire said it would be great. He said he would want to teach kids how to weld there. And so it went, one by one, young and old. I must have met 20 people from those blocks in Brownsville, and every single one wanted the gym. Wright said he was taking me to the corner where he envisioned it. We passed several shuttered houses on Hull alone and a closed corner store. We had attracted three young brothers: Kenrick, Malek, and Jalani Wilson. Kenrick, the oldest, couldn’t have been more than 9. Their mom told me that, just the other day, she had brought them and other boys from the neighborhood to the school playground and played football with them because there was no after-school programming. We reached the site of the supermarket where Wright imagined his gym. The squat, abandoned building still had its blue awning, and its gates were all tagged up. Wright described piece by piece what the gym would look like and how he would use each section of the building. It would be a place, he said, where youth can mature as athletes and as men. On the walk back to the Rockaway Avenue subway station, the last person I met was a baby-faced young man who called himself T. I had to be a full four inches taller than him, but when T. shook my hand, his grip felt like it belonged to a man 50 pounds heavier than me. He told me he discovered boxing when he got sent “up north” to the state penitentiary. He’s been back a while and hasn’t been in the ring since. There’s nowhere to train, he said. Just then, a man in a tattered sweatshirt tapped T. on the shoulder and asked to buy drugs: “You got something for me?” Both T. and Wright chastised him: “Look up. Pay attention.” When the haggard man looked at me, he spun around and walked quickly back down Rockaway. Everyone dreams. It was a dream — or the accumulation of dreams — that built Brooklyn. And didn’t someone have to imagine boxing back in the borough after 81 years? Didn’t someone have to imagine a building to house it? I couldn’t help wondering what the difference was between the dream of a multi-billion-dollar arena in downtown Brooklyn and that of a boxing club in Brownsville. Which is more impossible? Saturday night, after the fights, I walked back through Fort Greene and Clinton Hill. I walked through Bed-Stuy. I had Kid Chocolate’s left hook on my mind. I kept replaying Garcia’s knockout in my head, which led my thoughts to the aging Erik Morales, whom Garcia had sent spiraling to the canvas. I thought of Paulie Malignaggi’s Bensonhurst. And here I was back in the Bed-Stuy of Floyd Patterson, where I climbed the three flights to my apartment, thinking maybe I was too amped up to sleep, too amped up to dream. Patrick Rosal is the author of three award-winning books of poetry. His most recent collection, Boneshepherds, was named a notable small press title by the National Book Critics Circle. He has served as judge for the National Book Awards and is a former Fulbright fellow. He teaches in the MFA program of Rutgers University-Camden.